26986 NETSP3147 (Copy).jpg 500X638\NETSP3147 (Copy).jpg 26987 NETSP3147_3 (Copy).jpg 500X638\NETSP3147_3 (Copy).jpg Send A Hint! Product Description: less text Spoil that lucky someone with this unique and romantic gift. 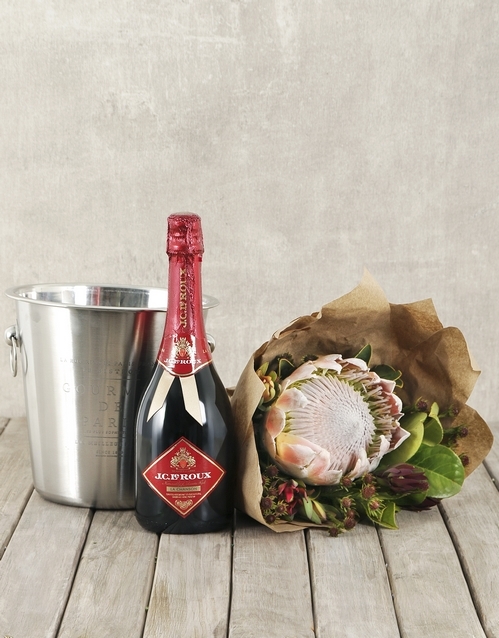 A stunning bouquet consisting of mixed greens and a magnificent king protea is combined with a luxurious bottle of JC Le Roux Red (750ml) and ice bucket. With both beauty and bubbles, what more could one ask for? Send now! 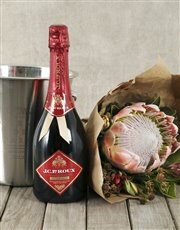 Get this Jc Le Roux Red King Protea Bouquet & Ice Bucket delivered with NetFlorist.